Over this past weekend, I spent 24 hours on Caye Caulker. Just a few miles away, a 30 minute water taxi ride, our little sister island is smaller, less populated and less developed. The sand streets, the pastel wooden buildings and the sparkling blue sea make it the PERFECT weekend getaway for visitors from just about anywhere. Even for me. Coming from the next town over. With the perfect hotel in the perfect location, I had a perfect time. It’s nice to be on vacation! I took so many pics that I split this post into two. Part One. And here’s part Two. With some more detail on my stay. I’ll start with my lodging, Seadreams Hotel. I chose it because of their strong links to the community – the owner is the Principal of the local High School – and their program Anglers’ Abroad. They have a small dock and a very pretty shallow beach on the lagoon side of the island. The hotel is multi-leveled and a bunch of different buildings and cabanas. The second floor is a huge deck with a bar – open for 4 to 7pm and for breakfast, which is included in your stay. Vines and flowers and petals…it’s DREAMY. This is THE PERFECT SPOT for a wedding. Picture the reception up here…lots of room and dancing…and furniture. The bar is THE CUTEST. And the ceremony? It would be on that tiny dock as the sun set! Are you swooning? Or is it just me! A peep inside. A full kitchen…bathroom…sitting area…air con…. Love getting some sun and swimming here and then showering off in my little cabin. Perfect. Just across the way is a small French restaurant named after the terrifying French “fairytale” Blue Beard. I’m not sure why I was surprised. I am a frequent visitor to the French bakery on Ambergris Caye. Why not? The specials included crepes with spinach and goat cheese. Yum. And there were two girls out front sipping icy glasses of rose. A very animated, friendly and very French gentleman named Axel came out to sheperd us in and explain the menu. Probably as I was about to google: gratin dauphinais. All you need to know is that it is DELICIOUS. The food – the crepe with goat cheese and a drizzle of honey, the beef with blue cheese cream sauce – is so tasty. (The cheese dolphin is in the center) But it feels a little bit odd eating this on a hot day at the beach in Belize. We walked around to the lagoon side of the island. We bought a $5bzd bag of sardines and fed the tarpon. The island is just too cute! We got down on hands and knees at the “Sea Horse Ranch” – where tiny, color shifting seahorses sway in the current with their tails curled around the roping. And then back down to the Split to get some sun…and leave my mark. Defend Cayo Rosario. You can pick up a sticker at the Belize Chocolate Factory for a $10bzd donation to the legal battle. For more information, check out the website. I’ll leave you with a few more pictures of this beautiful little island. And another promise that I will do this more often! Staying overnight in Caye Caulker is something that I am so LUCKY to be able to do! Why am I doing it once every FIVE YEARS?? The Belize Chocolate COmpany has a second location on Caye Caulker! Here’s a look inside the tiny shop. 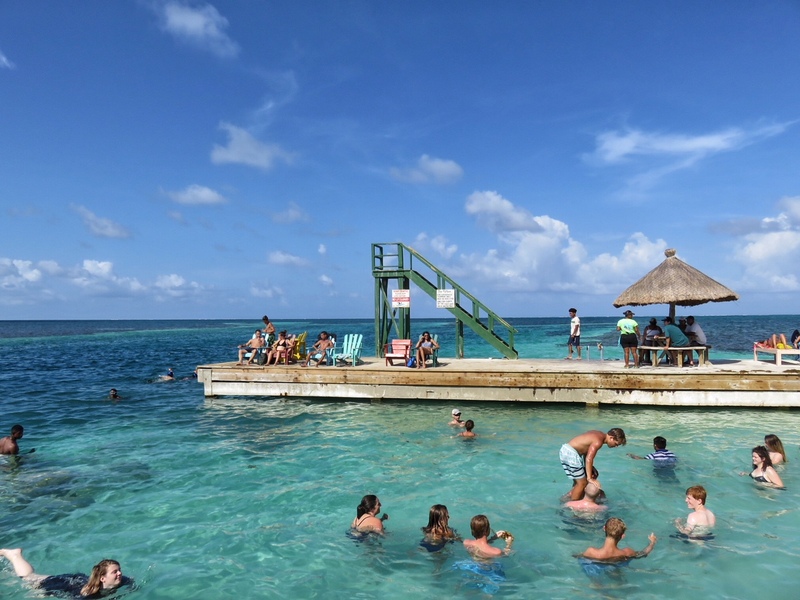 We’re coming to Belize in October and had planned to only stay in San Pedro and visit Caye Caulker for the day. But plans change. Now we’re spending the first 24 hours on Caye Caulker and so excited. We love this little island so much. Go Slow — that’s kind of our motto these days. Thanks for sharing some places in Caye Caulker I had not seen. You’re right, it is just too darn cute! I regret that we went there only a handful of times during our time on Ambergris Caye. It was such a nice place to unwind and away from the hustle and bustle of the “big island”! Your cabin looks absolutely comfy to me!